Why do I blog? | My research journey. On Friday I was one panelist at a seminar on blogging at CEDAM. It was a very interesting conversation about blogging, types of blogs, and various uses. I was asked my motivation to write blogs and as a blogger this is my answer. Why do I write blogs? I started writing my blog The adventure to become a PhD Student in Australia two years ago, just before coming to Oz. This blog is a personal and reflective diary on my life experience in Australia. It is written in Spanish because my mother tongue allows me to express more genuinely my views and feelings towards Australia, Chile and the daily turbulences I go through while I am doing my PhD. Writing about the PhD experience was not complete until I started reflecting on the research process as well, and that’s why I decided to write another blog in English. My research journey blog started as a need to put my ideas out about my research and confront my thinking. This blog is a reflective piece of writing about research focus, research questions, methodological concerns, data collection and more. Has writing blogs been useful for my doctoral studies? Of course, I believe that these blogs have mediated my learnings in all senses. 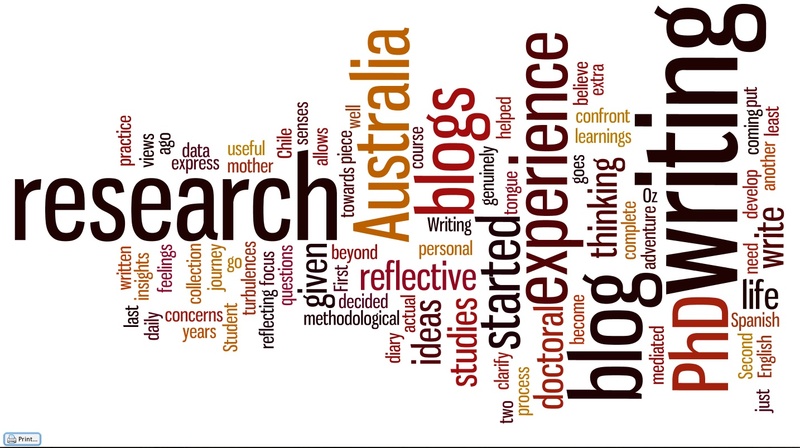 First, writing about my life experience in Australia has given me insights of the PhD as an experience which goes further beyond the doctoral studies. Second, writing about what I have been doing and thinking on my research has helped to clarify ideas or develop them further. And last, but not least, writing blogs has given me an extra practice on actual writing. I have also used blogs for my teaching. At home , I started using blogs to enhance my students’ experience in learning English and now at ANU I have used blogs for teaching Spanish. Last year in the Current Affairs Intermediate Spanish course we developed one class blog in which students posted a summary of a current affair in the Spanish speaking world. Students were also requested to comment on each other’s posts. This semester I am using a class blog as part of the Cuento Hispanoamericano course in which students have had to write two posts: one about a latinoamerican writer and his/her context, and the other one is a a creative writing piece, a mini short story. Students also interact with each other making comments. Has the use of blogs enhanced my students’ learning ? I absolutely believe so. First, students are active learners. They decide the content of their posts and they interact with their classmates making comments. Second,they develop their cognitive strategies to summarize and evaluate the content they write about on each post they write. Third, students are challenged with complex tasks immersing them into the spanish speaking world both into the language and the sociocultural context. And last, students improve their writing skills writing and writing. And last, but not least, I also write a blog to comment on fiction I read. I love reading and I like writing about the things I read. Some posts are in English and others are in Spanish, it varies according to the language the book is written. Writing about books is fun! Yes, I definitely advocate for the use of blogs for research, teaching, reflection and fun! Pingback: Tips for better blogging | My research journey.